If you are new to the GSH Website, you will need to create a login ID to register and participate, thank you. This webinar series will expand on seismic interpretation. Session 1 is a quick review of the geophysical theory behind seismic interpretation. Session 2 covers well-seismic ties and extracting structural information from seismic data. Session 3 focuses on extracting depositional sequences and system tracts. In session 4 we will discuss how we extract depositional environments and infer lithofacies. We will also look at some interpretation methods for the exploitation stage. Short lectures will prepare you to do hands-on exercises. The instructor will walk you through the various analysis techniques. Come prepared to work. 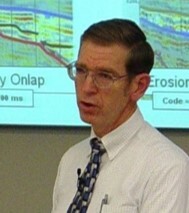 Fred Schroeder holds a BS in Engineering Physics from Lehigh University and a Ph.D. in Marine Geology from Columbia University. For most of his career he worked as a seismic stratigrapher developing and applying new interpretation methods. For two years of semi-retirement, he was an contract trainer within industry and at Texas A&M. Serving as a volunteer, Fred has given seminars and short courses to over 2500 students. Working with IRIS, he has placed many of his training materials on the web to help educate graduate students. Miss part of the sessions? Never fear. All sessions are recorded and available for later viewing by registered users.